There are three types of radio sources found in galaxy clusters like Abell 1033, a cluster of over 350 galaxies located about 1.7 billion light-years away. Collisions between galaxies in clusters are common events, and each merger heats and shocks the nearby gas. The rapidly moving, ionized gas then radiates intensely at radio wavelengths. The first, called radio relics, are found in the outskirts of galaxies and have radiation signatures characteristic of shocked material over large scales. The second type, called radio haloes, are centrally located in the cluster and are probably the result of large turbulent motions set up during collisions. A radio phoenix is the third type of cluster radio source, and is much less well studied. After the initial effects of a collision have died down and the gas has cooled, the radio emission subsides. But a subsequent merger nearby can produce a strong shock wave, and if that passes through the fossil material it can compress and re-energize it to emit in the radio again. The image above is false-color X-ray image of the galaxy cluster Abell 1033. The white contours help identify the X-ray flux levels, and the red contours trace the radio emission. The elongated red structure in the lower center is a radio phoenix: fossil gas that has been reheated by shocks from a nearby galaxy merger (obscured in this view). 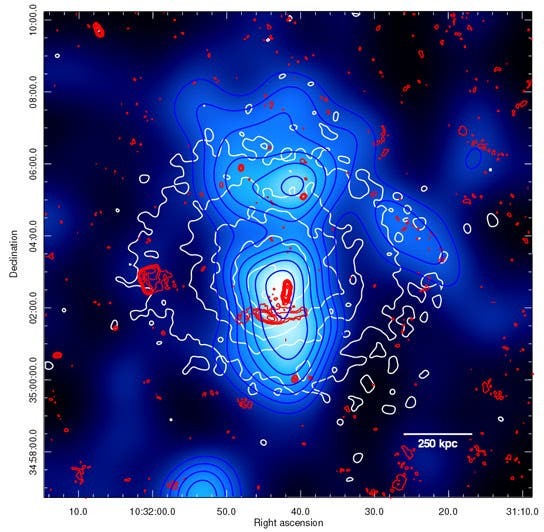 CfA astronomers Georgiana Ogrean and Reinout van Weeren, with five colleagues, used data from the Chandra X-ray Observatory, the Westerbork Synthesis Radio Telescope, the Very Large Array ad the optical Sloan Digital Sky Survey to study the Abell 1033 cluster and its family of galaxies. They discovered two subclusters in the source that seem to have recently collided; they were spotted from their X-ray emission. Close to this region, and to a galactic nucleus, the team spotted a radio source with the emission and charged particle characteristics of a radio phoenix. The scientists conclude that shocks from the recent merger have propagated into old gas, reinvigorating this fossil remnant to new life. "Abell 1033: Birth of a Radio Phoenix," F. de Gasperin, G. A. Ogrean, R. J. van Weeren, W. A. Dawson, M. Bruggen, A. Bonafede1 and A. Simionescu, MNRAS 448, 2197, 2015.